Revelation 3:1 "And to the angel of the assembly in Sardis write: "He who has the seven Spirits of God, and the seven stars says these things: "I know your works, that you have a reputation of being alive, but you are dead. Revelation 3:4 Nevertheless you have a few names in Sardis that did not defile their garments. They will walk with me in white, for they are worthy. 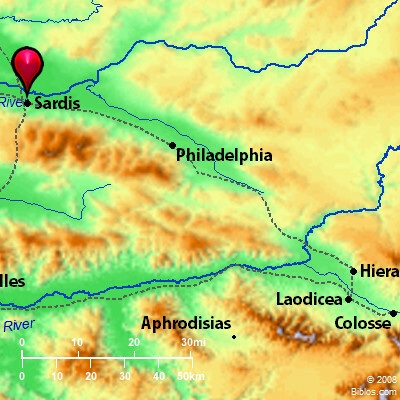 sar'-dis (Sardeis): Sardis is of special interest to the student of Herodotus and Xenophon, for there Artaphernes, the brother of Darius, lived, and from there Xerxes invaded Greece and Cyrus marched against his brother Artaxerxes; it is also of interest to the student of early Christian history as the home of one of the Seven Churches of Re (1:11; 3:1;). It was moreover one of the oldest and most important cities of Asia Minor, and until 549 B.C., the capital of the kingdom of Lydia. It stood on the northern slope of Mt. Tmolus; its acropolis occupied one of the spurs of the mountain. At the base flowed the river Pactolus which served as a moat, rendering the city practically impregnable. Through the failure to watch, however, the acropolis had been successfully scaled in 549 B.C. by a Median soldier, and in 218 by a Cretan (compare Revelation 3:2, 3). Because of its strength during the Persian period, the satraps here made their homes. However, the city was burned by the Ionians in 501 B.C., but it was quickly rebuilt and regained its importance. In 334 B.C. it surrendered to Alexander the Great who gave it independence, but its period of independence was brief, for 12 years later in 322 B.C. it was taken by Antigonus. In 301 B.C., it fell into the possession of the Seleucidan kings who made it the residence of their governor. It became free again in 190 B.C., when it formed a part of the empire of Pergamos, and later of the Roman province of Asia. In 17 A.D., when it was destroyed by an earthquake, the Roman emperor Tiberius remitted the taxes of the people and rebuilt the city, and in his honor the citizens of that and of neighboring towns erected a large monument, but Sardis never recovered its former importance (compare Revelation 3:12). Again in 295 A.D., after the Roman province of Asia was broken up, Sardis became the capital of Lydia, and during the early Christian age it was the home of a bishop. The city continued to flourish until 1402, when it was so completely destroyed by Tamerlane that it was never rebuilt. Among the ruins there now stands a small village called Sert, a corruption of its ancient name. The ruins may be reached by rail from Smyrna, on the way to Philadelphia. Dr. C. C. Tracy, of Marsovan, has made a visit to ancient Sardis and observed the work of his countryman, Professor Butler, of Princeton University, who is uncovering the ruins of that famous city of the past. Already rich "finds" have been made; among them portions of a temple of Artemis, indicating a building of the same stupendous character as those at Ephesus and Baalbec, and a necropolis from whose tombs were unearthed three thousand relics, including utensils, ornaments of gold and precious stones, mirrors, etc. What chiefly impressed Dr. Tracy was the significance of those "Seven Churches of Asia," of which Sardis held one. "When I think of the myriads of various nationality and advanced civilization for whose evangelization these churches were responsible, the messages to the Christian communities occupying the splendid strategic centers fill me with awe. While established amid the splendors of civilization, they were set as candlesticks in the midst of gross spiritual darkness. Did they fulfill their mission?" One of Dr. Butler's recoveries is the marble throne of the Bishop of Sardis; looking upon it the message to Sardis recurs to mind. A fact of current history quickened the visitor's appreciation of the word to "the angel" of that church. "Yonder among the mountains overhanging Sardis there is a robber gang led by the notorious Chakirjali. He rules in the mountains; no government force can take him. Again and again he swoops down like an eagle out of the sky, in one quarter of the region or another. From time immemorial these mountains have been the haunts of robbers; very likely it was so when Re was written, `I will come upon thee as a thief.' In each case the message was addressed to `the angel of the church.' Over every church in the world there is a spirit hovering, as it were-a spirit representing that church and by whose name it can be addressed. The messages are as vital as they were at the first. `He that hath an ear, let him hear what the Spirit saith unto the churches.' "
SAR'DIS, the capital of Lydia in Asia Minor, on a site of great beauty, 48 ms. due e. from ancient Smyrna. Now called Sart, with extensive ruins. Its site is now unhealthy and few inhabit it.